Blood Moon Update… Counting down! Well, for several years there has been a buzz, largely generated on the research of Mark Biltz concerning the upcoming Blood Moon tetrad. We have written several times about this upcoming sign in the heavens and now wait, with baited breath, to the see the first of the four, weather permitting! A graphic depicting where this first eclipse will be visible is available here. More information of the future events can be downloaded from the NASA site. One thing I find interesting is that all four blood moons are visible in the US, and parts are visible to the rest of the world, while only part of the last (if I recall) is visible from Israel. Warning to the world? I don’t know…. A note that I’d like to make is that I do not expect something to happen ON the first blood moon, but I do expect detractors to come out of the woodwork if nothing happens right away. The point is, this is a sequence of signs that take place over about 18 months and can be interpreted in a number of ways, so we must take a ‘long view’ unless there is an unmistakeable fulfillment. Recall, the fulfillment must involve Israel! Regardless, this sequence is HIGHLY unusual and, I think it doesn’t happen again for about 100 years. Adding to the unusual nature of this sequence is that they all fall on feast days, where I do not think that has happened before. 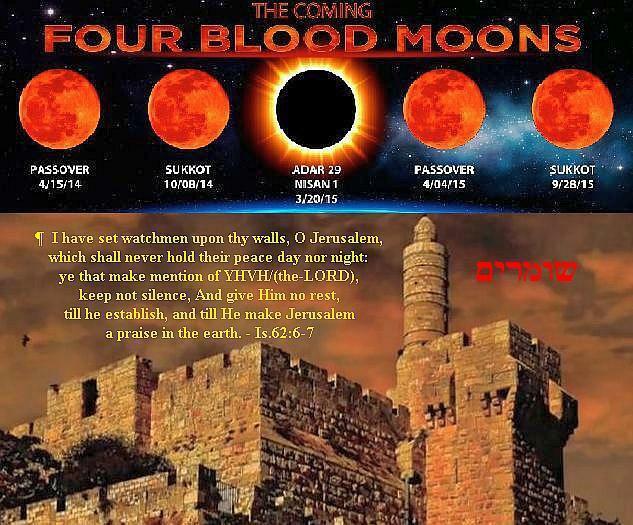 A final note, for those who may be scratching their heads at either the significance of the blood moon, or at the significance of being tied to Feast Days, you may want to read this: The Sign of his Coming… Can We Know? I hope this blesses and encourages you… Share if you enjoyed! This entry was posted in A Thought... and tagged April 14, blood moon, blood moon tetrad, feasts, NASA, Passover. Bookmark the permalink. 7 Responses to Blood Moon Update… Counting down! It seems now to set the date of the Passover due to these Blood Moons. I have not been certain in the past as to which is the actual date because some say this and some say that and some say the book of Enoch must be read to understand the exact date of the Passover each year. This may be the first year that I have the tools to make the decision as to when to start the Passover. Going into Sabbath Rest at sunset tonight for the Passover. I have tried not to get ‘wrapped around the axle’ over dates. we should try our best, but in the end, expect Yeshua to rightly teach this in His timing… Our Father is more concerned with attitude than precision. See Numbers 9:6-14. That being said, I do find it interesting that though many do not agree with the Hillel II calendar, all the blood moons fall on the high days of that calendar… Just saying. Judah has the scepter. In this area, I follow and wait for the Messiah! Shalom and blessings to you and yours this Pesach. Peace to you also on this high week. Numbers makes that very clear from several passages. The one you mention, also 15:14-16, 29, and another I do not recall right now. Honestly, it is beyond debate, but jealousy and harassment rear their ugly heads. (Isaiah 11:11-13ff). http://www.youtube.com/watch?v=4CSNrXEUCag at 58:06 stop the video and look at the man’s hands. Is he getting off base and off Scripture a bit too much?